I hope you are enjoying this study as much as I am! I am learning SO MUCH. If you've missed this book study, you can catch up with these links! 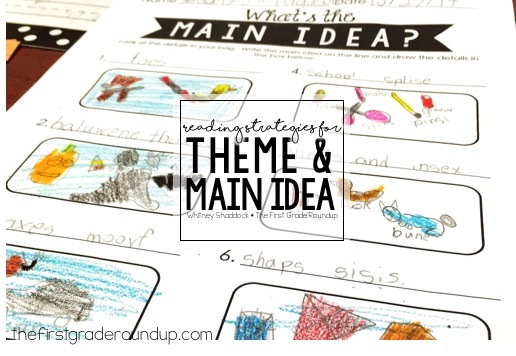 Today, let's talk about THEME and MAIN IDEA. Which are basically the same thing. 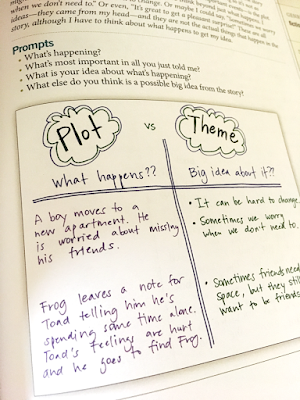 While both are about the reader determining big ideas, the reader has to do them in different ways for fiction (theme) and non-fiction (main idea). I'm embarrassed to admit I was not great at teaching theme in first grade until the Common Core standards were released. Our district used the suggested Common Core Units and one of them was on fables and life lessons. "We are likely to feel theme in our gut!" I loved using literature to teach important life lessons to my firsties through theme. Here are my favorite strategies from the book. I've had so many moments just like this one when reading this book....WHY DIDN'T I THINK OF THAT??? 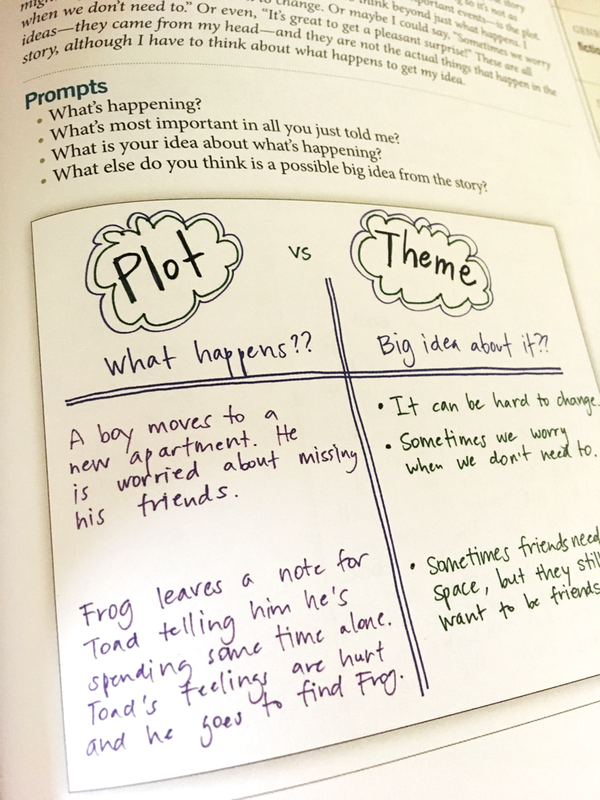 I loved the T-chart example she had in the book and the idea of jotting down the main plot points and what the big idea is about it! This would be a great scaffold for struggling kiddos. When it's hard to think about the whole story, we can break it down into the important plot points and just think about the theme for that part! This is what we used for our Life Lessons fables units. But, I didn't use this exact language and I LOVE using the word mistake. I feel like that is the perfect word for helping kiddos hone in on what went wrong and how that character might fix that behavior next time. In fables, this is the perfect lead in to their theme or moral. I prompted my kiddos with, "What lesson can we learn from this story?" And that worked well for many kids. But I think her prompt of, "What mistake did the character make? What lesson can we learn from his/her mistake?" gives easier access for ALL kids! Love this idea! I don't know about you, but I find that teaching main idea in non-fiction is easier than theme in fiction in first grade. I just think the first grade non-fiction books make the main ideas more obvious that others. So, I love diving into non-fiction early to help my firsties understand main idea during our animals unit and then transferring that understanding to fiction later when we study fables. This describes a strategy for readers on levels M-Z, which is clearly NOT the majority of our first grade readers! :) BUT, I chose this strategy because it is very similar to one of the most popular main idea games we do in first grade. In the strategy in the book, readers list similar facts and then look over them again more closely so that they can determine a main idea. In first grade, I differentiated this strategy for Main Topics. 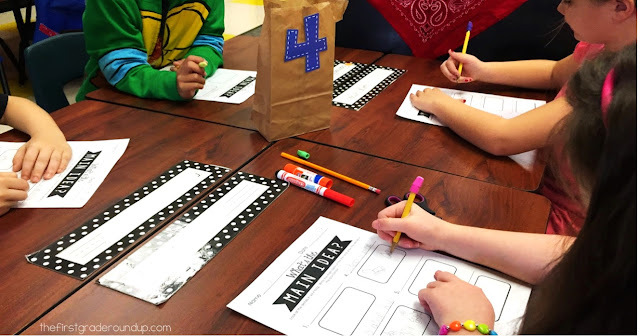 I made 6 bags of details that connected to our animals unit we were learning about or just the time of year. Each bag represented a Main Topic with the details inside. You can read more of the details of how this worked in this blog post and find the FREEBIE in that post. But essentially, my firsties worked in groups to add up the details from a bag and determine a main topic. It's engaging, it's group work, it's hands on, and was always a first grade favorite in my room!